Just in case you had trouble sleeping after Kim Jong Un and Donald Trump traded threats about each ruler’s “nuclear button,” the North Korean supreme leader also said something uncharacteristically optimistic in his New Year’s Day speech. Kim expressed hope for a “peaceful resolution” to the half-century-old conflict with South Korea and said that talks should start “as soon as possible.” Accordingly, he also ordered a long dormant phone line between North and South Korea to be reopened. The first call between the warring nations took place on Wednesday. But about those newly operational phones. 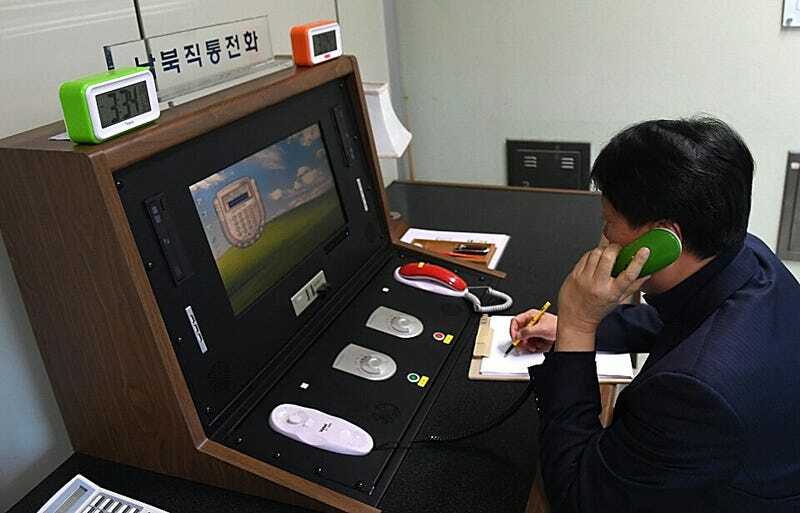 The main hotline between North and South Korea stretches between two buildings in the border village of Panmunjom, which lies in the demilitarized zone. The South’s phone is less than 100-meters (about 328 feet) from the North’s, and until this week, the two sides hadn’t had a conversation since 2016, when Seoul shut down the Kaesong industrial complex in retaliation for Pyongyang’s nuclear testing. The Kaesong complex employed both North and South Koreans. North Korea effectively stopped answering South Korea’s calls, even though the South has continued to call the North twice a day for nearly two years. North Korea just never picked up the phone. The phones themselves don’t look terribly sophisticated. While we don’t know what kind of hardware the North is using, there are plenty of photos of the terminal on the South side. It looks a little bit like a big video slot machine with a computer screen in the middle that may or may not be running Windows XP. There are two handsets: one green for the South to make calls to the North and one red for receiving calls from the North. There’s also a green clock with Seoul time and a red one with Pyongyang time which is 30 minutes behind. There are three USB ports flanking both sides of the screen as well as two DVD players, which could be used for installing software. Finally, there are two grey modules next to the handsets with red and green buttons below them. Oh, and there’s a fax machine to the left of the whole terminal, for sending faxes. This apparently antiquated system is now the only official channel between North and South Korea. The radio silence ended at 3:30 GMT on January 3, when the two sides spoke for 20 minutes to test the line and ensure the technology was still functioning properly. Back when these kinds of calls were more ordinary, there would be two a day: one at 9:00am and one at 4:00pm. A former South Korean communications officer told the Yonhap news agency in 2008 that the five-minute-long conversations were all business. “All the phone calls were official. We didn’t exchange any unofficial jokes,” said Kim Yeon-cheol. So there’s a lot going on here. It seems great that the North Koreans and the South Koreans have their old phones fired up again. Whether or not that brings us closer or further away from nuclear war remains to be seen.